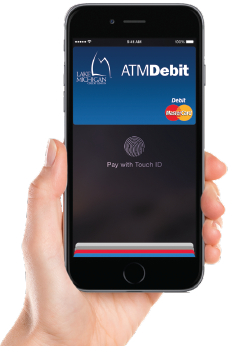 News from LMCU: Apple Pay™ is here! Carry your wallet in your iPhone! With your iPhone® 6, iPhone 6 Plus or Apple Watch use Apple Pay at participating merchants nationwide to conveniently make purchases. Now, paying in stores happens in one motion — there’s no need to open an app or even wake your display. To pay, just hold your iPhone near the contactless reader with your finger on Touch ID. You don’t even have to look at the screen to know your payment information was successfully sent. A subtle vibration and beep confirms your payment. You can also use Apple Pay within apps on iPad Air 2 and iPad mini 3, and pay with a single touch. Checking out is as easy as selecting Apple Pay and placing your finger on Touch ID. Give your wallet a rest— download Apple Pay today! Visit apple.com to find out how.